Virgin Media Cable User Looking to come across to SKY/BT- Plenty of Questions! I'm a long standing Virgin Media customer who is finally fed up with the £25 per month charge for 4mb unlimited. If i move over to SKY BB and Sky Talk i will save about 20 quid a month, so better in my pocket as they say. I have some questions though about SKY/BT and a few other things if you good people could indulge me? Can i keep my telephone number and bring it with me from Virgin Media (cable) to a BT Line? Whats the ethernet port performance on the netgear router? I currently have USR router that claims to be 100mb, but peforms more like 10! Not good when multiple PCs logged into it and planning to bring a NAS device into the equation in the coming months. £10 a month for unlimited, is it truly unlimited? What is the behind the scenes monthly GB limit? Is newsgroup access allowed? I know there is no usenet server on SKY, but they don't block port 119 for example? Finally, i have a question regarding my BT line, or rather the lack of it. The previous occupants of the house had cable installed and appear to have cut the wire for the BT outside the house!!!?!? Is it possible to maybe put a terminator box or something out there and then run the 2 sockets i need off that? Or does the cable have to terminate in the master socket? If thats the case, can the cable be extended/patched or will that give me "line and speed" problems later on? I really don't want to have to pay the £125 for a new line if i can help it, so would like to try and get whats there now working! Think thats about it for now. Thanks in advance for your help. No doubt more questions to come. Re: Virgin Media Cable User Looking to come across to SKY/BT- Plenty of Questions! I can only answer your question about news groups. Though sky does not have a newserver, there is nothing to stop you connecting to Giganews (as i do) and they definitely do not block port 119. Unofficially, 250gb on MAX, however there have been NO reports of this ever been enforced. However, for the benefit of everyone else on Sky, as a matter of courtesy if you are going to hammer your connection, I would schedule downloads for overnight. You do not have to, but if everyone adopted that attitude, I would bet there would not be any need for any traffic shaping - on any ISP. 250gb!?!?! LOL, that'll be more than plenty for me!! Last edited by rishy; 29-07-07 at 02:05 PM. I, like you was a Virgin customer up till about a month ago. Apart from the lack of a sky Newsgroup service, Sky has provided me with an excellent service - I have Sky+ (4 mix), BB Max (I still get a 4Mb Connection for a tenner) and unlimited phone calls for a fiver - this saves me about £30 a month compared to VM. I can recommend moving to sky without any hesitation. Good luck! Your number will transfered on an agreed date and time (same day as engineer reconnects you), on the day you'll be able to make outgoing call's but until the port is complete you can't receive calls. Mine didn't port till 8pm. Thats great, thanks for the replies. i think i'll get onto bt this week and see about the cut cable and take it from there. 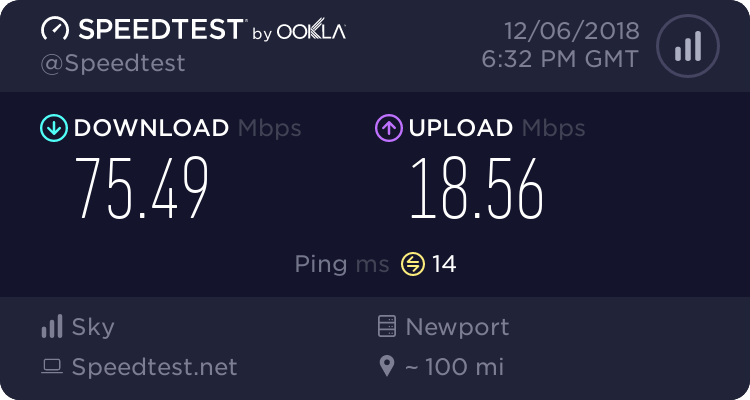 What about the ethernet port speeds? Any figures on that? I'm currently getting about 8mb/sec between 2 pc's connected to my current router and that just inst good enough for file transfers! The router is 100mb, tho I've never tested it between 2 pc's.